My main reaction to the experience of participating in the Sherwood Forest Archaeological Field School at King John’s Palace in Clipstone, Nottinghamshire is this: medievalists not in the field of archaeology should participate in this field school or something like it. I cannot emphasize that enough. This opportunity was unique and eye-opening. It both reinforced my passion for the period as well as opened up new avenues of experience. When I first arrived at the field school, our hearty band of nine volunteers introduced ourselves to each other. At my turn, I added that being on an archaeological excavation had been a bucket list item for many years. This is true. 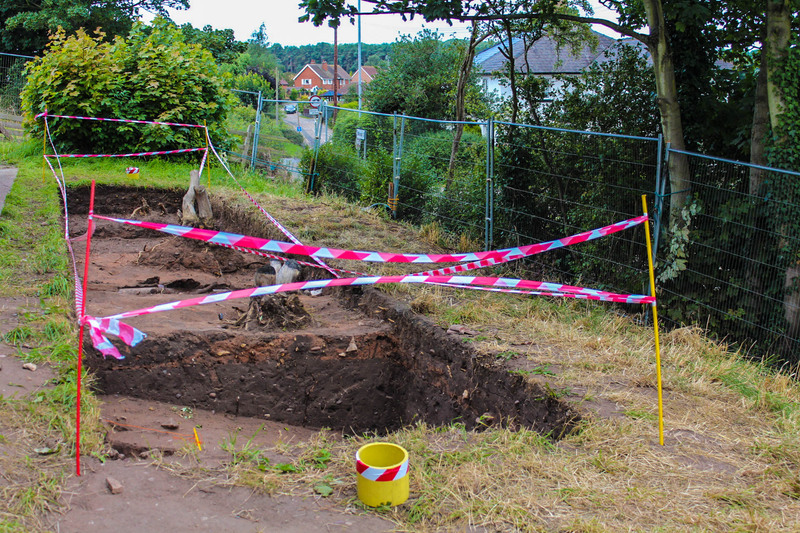 The archaeologists from Mercian Archaeological Services leading the site laughed when I said it was a bucket list item. Like any of us, they know the tedium and hard work that goes with their job, but, for me, I have been fascinated with archaeology for as long as I can remember. The act of uncovering even the tiniest of artifacts, piecing together the story of a location, people, or event, is not only an interesting endeavor, but, I feel, a necessary one in order to understand the past. I really would have been content at almost any site, but to participate in one in the heart of Sherwood Forest, the heart of the land that I’ve studied and dreamed about since I was a child? This was unbelievable. King John’s Palace – the above ground part! On our first day, Andy Gaunt of Mercian explained some of the history of King John’s Palace and the surrounding area. I have in a previous post mentioned the history of the Palace, particularly that six successive Plantagenet kings from Henry II to Edward II used and visited it. As with any other architectural structure, it was built up, neglected, added on to, and burned at regular intervals throughout its history. Much of the excavations have attempted to define the boundaries of the Palace land, particularly the early versus later ones. Our job on this field school was to excavate a trench on an embankment in order to begin the determination if it might be an outer wall of the early Palace. More on that later! Part of Andy’s initial briefing was to talk about Sherwood Forest. 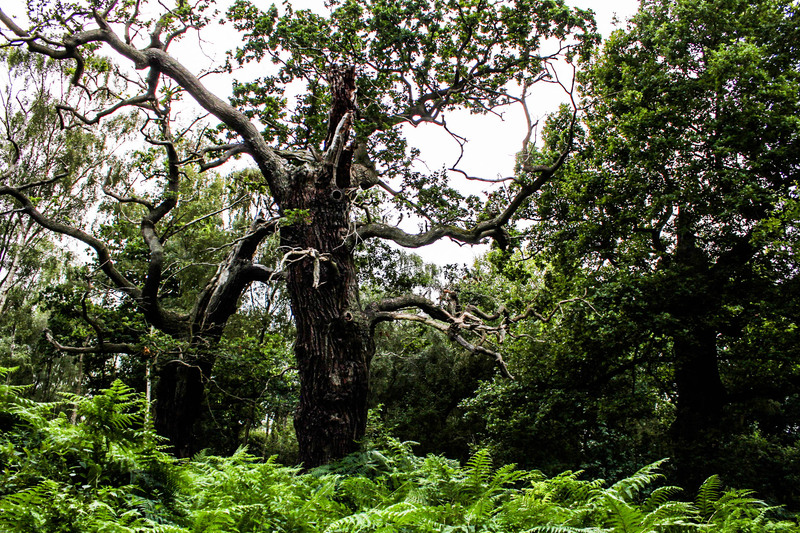 It’s easy enough to say blithely – and I have frequently before this experience – that a medieval forest is not just trees. It is different, however, to see the landscape in context. They explained that the area around the Palace still looks very similar to what it did in the Middle Ages. The Palace would have been visible from any direction of approach. The small village of Clipstone (or Kings Clipstone as its known to distinguish it from the bigger, modern town of the same name) would have existed in a similar configuration as it does now. But it certainly was and is not in the middle of what we typically call a forest. As Andy pointed out, the Sherwood Forest Visitor Center is this typical forest landscape, but the original Sherwood encompassed forest, heath, villages, buildings, hunting-scapes, etc. In reality, it was a huge area. 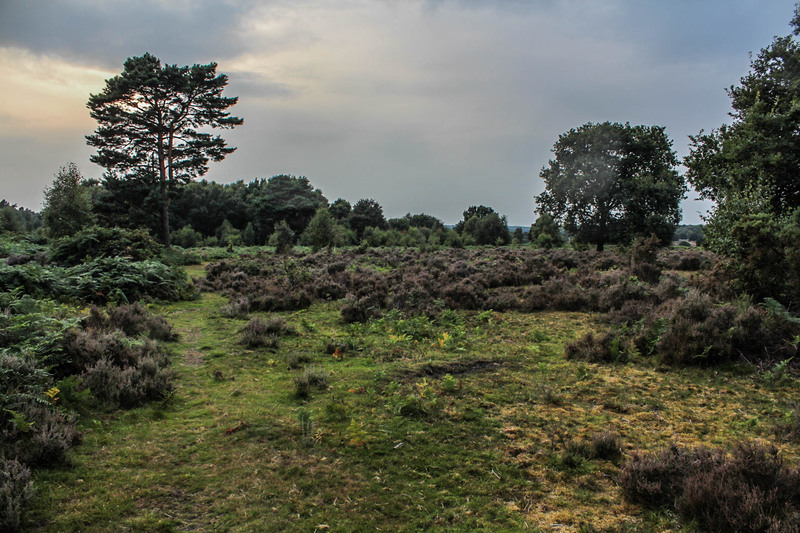 Again this is a known fact, but to witness it – to see the land around the Palace where the kings and their guests would have stayed, the heaths in what is now called Sherwood Forest that would once have seen hunting parties riding across them, the ancient and veteran trees that have witnessed the comings and goings of history for centuries – is a different experience. 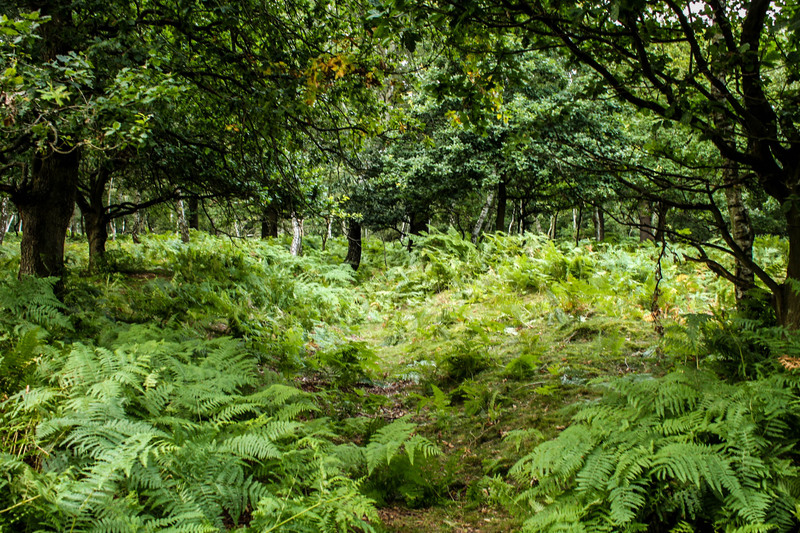 Look closely – the indent of a medieval path still exists through the forest! 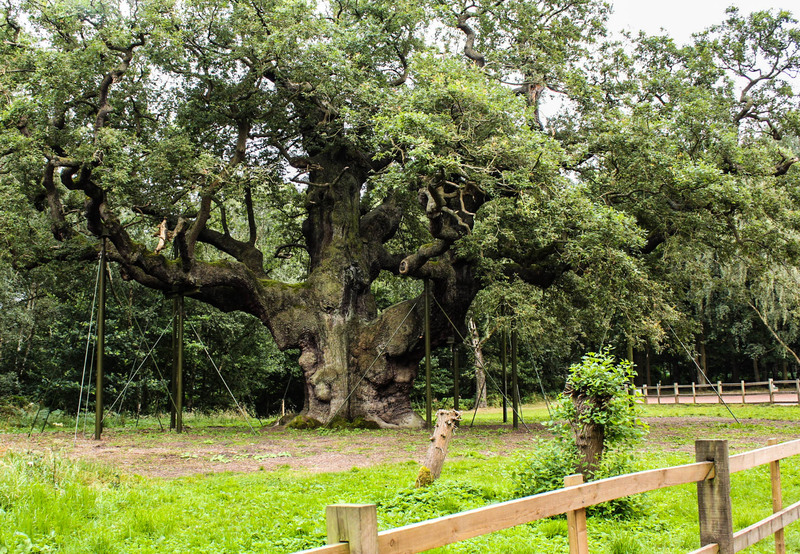 Popular impression of what Sherwood Forest was/is – trees! It reinforces and provides context for image after image described in medieval texts. No less importantly, it grounds those texts. Quite literally. It grounds them in the feel and presence of their own settings. In the next couple of posts, I will give some detail about my other impressions of participating in the field school as well as some of the archaeology skills we learned. In preparation for my Sherwood Forest Archaeological Training Field School, I have been doing a lot of reading. In particular, I was pleased that James Wright’s book A Palace for Our Kings: The History and Archaeology of a Medieval Royal Palace in the Heart of Sherwood Forest came out at the end of June. 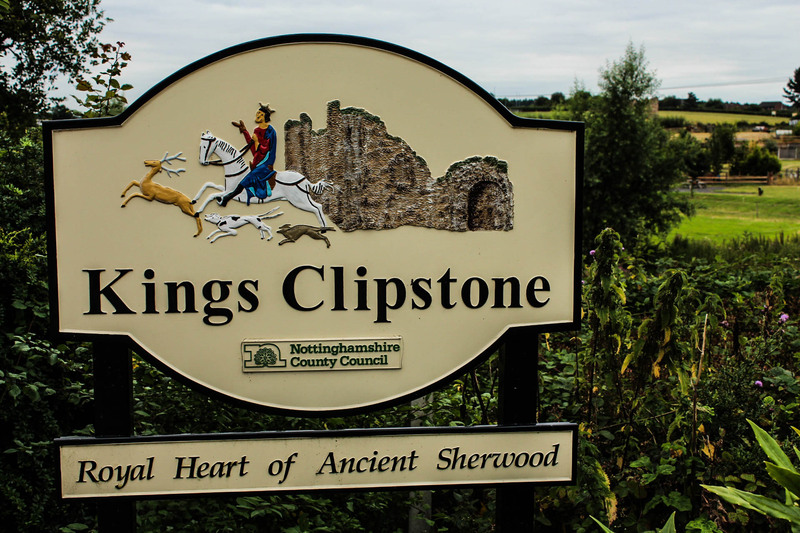 It is specifically about the history and excavation of King John’s Palace at Clipstone, which is were I will be located. While I haven’t completed reading it yet (too many deadlines this summer!) – I am hoping to do so on the plane ride over – there have been several aspects that have intrigued me that I will share here. Some are thoughts; some are simply a collection of quotations around a concept. Some I am reacquainting myself with, some are ideas I want to remember as I begin the excavation, and some are totally new and specific to Clipstone. There will be more as I continue to read! Citing the Oxford English Dictionary, Wright defines a palace as ” a large and impressive building forming the official residence of a ruler, pope, archbishop, etc.,” which is what he calls a “pleasingly malleable definition” (5). Later, he provides what is perhaps a more inclusive and useful description: “Palaces were used in remarkably elastic fashion by the monarchs. Their purposes varied according to a wide variety of circumstances not just from king to king but even within individual reigns. The personal preferences of a king might lead to a combination of reasons to visit a particular palace which may have involved sport, recreation, councils, parliaments, building campaigns, impressing magnates and dignitaries, retreating from plague, or as a resting point on a longer journey” (17). The Palace at Clipstone was one of the more impressive and maintained residences over the course of several reigns. The scale of Clipstone “lifts it to an entirely different level [than manor houses]” as it “stretched to seven and a half acres of enclosed land” (6). I found it intriguing that the area of Clipstone is associated in “strong local tradition” with the death of King Edwin of Northumbria. He died in the battle of Hatfield in 633, long before the palace at Clipstone was established: “The precise location of the battle is not fully understood, but placename evidence and the discovery of a large number of skeletons during the 1950s in an apparent mass-grave beneath foundations of the north wall of the twelfth century church at Cuckney, six miles to the north-west of Clipstone, has led to speculation that it may take place close by. Traditional stories persist that, prior to his burial at Whitby, the slain king was interred at nearby Edwinstowe and it is possible that King John’s 1205 foundation of St Edwin’s Chapel in Birklands may have been related to this” (19-20). Mercian Archaeological Services, who sponsors the field school I am attending, received permission and funding to fieldwalk the area of St. Edwin’s Chapel in 2014. 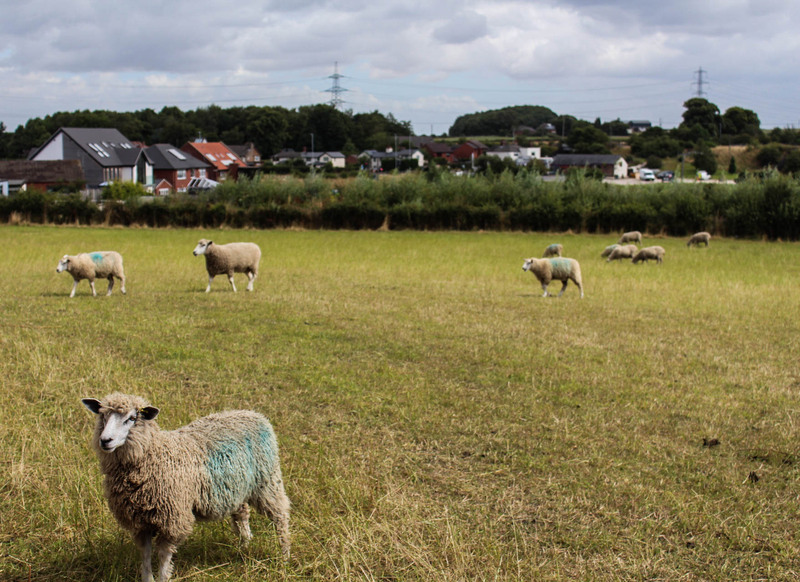 There are as always several dates involved when considering the multi-century history of a location like Clipstone. I found it useful to mark when kings first visited the site (chart below). Although a manor had been there prior to the Norman invasion and there is evidence of repairs and construction on the site, Henry II in 1181 is considered the first documented royal visitor to “his palace and deer park” (27). It is interesting that he visited Clipstone after the wars with his sons, wife Eleanor of Aquitaine, and other political leaders that they recruited. When he won, he set about essentially strengthening his hold over castles and forests, including Sherwood. Richard I first visited Clipstone immediately after he returned from his imprisonment. I like to imagine this as a much-needed respite before setting about punishing John and the other rebels. Wrights claims that it was to make sure Clipstone was in order for a later meeting with the Scottish king William the Lion (39). Citing Roger de Hoveden, Wright comments that Richard traveled to Clipstone and Sherwood, “which he had never seen before, and they pleased him greatly” (39). John seems only to have been at the palace, at least according to any remaining official records, nine days in total over seven visits (41), but he was in the area quite frequently so there could be many unrecorded visits as well. Henry III is the one who really took an interest in the architectural design of the Palace and ordered quite a bit of construction, particularly in response to the comfort of his queen Eleanor. Edward I held parliament at Clipstone in 1290, where he announced the plans for another Crusade (68). Edward II differed greatly than his predecessors in that he spent more time at each of the locations he visited, including Clipstone. I suspect this is due to the changing nature of centralized government and the perceived security of the times. Exciting news! I have received the Marion and Jasper Whiting Foundation Fellowship to participate in the Sherwood Forest Archaeological Training Field School 2016. This program runs August 8th-12th. 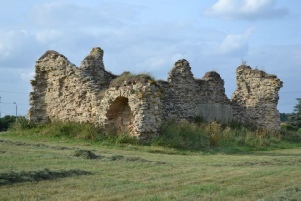 The Field School is organized by Mercian Archaeological Services CIC and is located at the ruins of King John’s Palace, Kings Clipstone, Sherwood Forest, in Nottinghamshire, England. The benefits of this project to myself, my students, my discipline, and my university fall into four categories: continuing education, pedagogy, community outreach, and future scholarship. These particular themes are essential aspects of my research and teaching. This experience will provide practical knowledge and a unique perspective to complement my previous academic study. The list above of topics covered in the Field School are ones that often are included in my courses. For instance, Robin Hood is a unit in my medieval literature study abroad course (link to blog post on that: “English Studies Abroad: A Gest of Robyn Hode“), Henry II and Richard I are kings I frequently include in historical background discussions, religious buildings and castles are prevalent settings for texts, forest law is key to histories (particularly with respect to royal rights), and courts and law in general provide context for understanding the medieval world view. In addition, in my courses with medieval content, I teach several texts that fall into the genre of romance, a significant body of work of the time period. The forest and hunting are ubiquitous aspects of these texts, and it is important to provide historical context to students about these unfamiliar settings. As the Field School site states, Mercian Archaeological Services CIC has “interpreted the surrounding lordship [around King John’s Palace] as a ‘designed’ medieval romantic hunting landscape.” In essence, this is the exact setting of these romance texts, and taking photos and videos of this example of landscape will be helpful for many students who find it hard to imagine it. I intend to video interview the experts at the site in order to create a compilation that I can share with my students. Given that I teach not only medieval literature, but also early world literature, the Bible as literature, and classical mythology, archaeological sites are recurring elements of my courses. Much of what we read in these courses was found in such sites or is continuing to be found. We study the site at Troy, the location of the Dead Sea Scrolls, the remains of Hadrian’s Wall, the burial site at Sutton Hoo, the recent discovery of Richard III’s skeleton, among many others. In some courses, I require my students to visit the Fitchburg Art Museum, which has ancient artifact collections. Indeed, my courses are some of the few at Fitchburg State that provide exposure to archaeology as a method of studying the past. More recently, I have started beginning my courses (particularly general education courses) with “why are we studying this subject” units, which I have found effective in helping students to think about the value of their courses and curriculum, rather than simply defaulting to thinking they are required to take certain subjects. For example, I begin my World Literature I course with a unit that includes readings and discussion related to the idea of present and historical deliberate destruction and appropriation of cultural heritage. In particular, we study the destruction by ISIS of archaeological sites in the Middle East and the protection of library collections in warzones by private citizens, many of which have direct connections to the texts we read in the course. By foregrounding the class with such a unit, students begin to understand the value of what we are studying (i.e. if cultural heritage – including literature – is targeted for destruction and is key to preserve, then what we study is important), and I have seen a marked increase in investment. However, as I have not previously participated in an archaeological dig, my understanding of the workings of these sites and how artifacts are discovered and preserved is theoretical, which makes deepening our study of and fielding questions about these subjects difficult. In the past, I have invited working archaeologists as guest presenters to provide students more context, but having my own experience to impart will be far more consistently beneficial. Participating in the Field School will provide a new dimension to such talks. I will especially volunteer to speak at local historical societies in addition to academic venues such as those above. I also am considering proposing a National Endowment for the Humanities summer program workshop on the topic of Robin Hood, which has the potential to bring scholars from around the country to Massachusetts and Fitchburg State. Finally, in terms of my own personal research, I would like to pursue two separate approaches. The first article I would consider is the pedagogical benefits of such an experience, exploring the effect on teaching and learning early literature from being able to incorporate practical knowledge into courses. A separate article, also pedagogical, would be to consider incorporating archaeological field experience into study abroad courses. The second topic would be the applications of archaeological study to medieval literary studies, thinking about how the interaction with the physical affects our reading of the textual. As a public scholar, I intend to write a series of day-by-day (pre-, during, and post-) blog posts on the academic, pedagogical, and personal aspects of the experience. I am co-founder of MassMedieval as well as The Lone Medievalist Project, so stay tuned for a blog series and photolog! What do you do when you realize that you and another professor at a different university are both teaching Thomas Becket in the same week for study abroad courses? Why, you wheedle that professor into writing a guest post, of course! Actually, it didn’t take much arm-twisting. Cameron very graciously – and very quickly – agreed to guest for us in my ongoing English Studies Abroad series. Cameron Hunt McNabb is an assistant professor of English at Southeastern University in Lakeland, FL. She specializes in medieval and early modern drama, and she has articles published or forthcoming in Neophilologus, Pedagogy, and Early Theatre. To begin, I’d like to thank Kisha for inviting me to guest post here. She has been a fountain of creative and engaging pedagogy for me, so it’s an honor to contribute to one of her projects. My study abroad course is following similar lines as Kisha’s, though we are traveling in May for 2 weeks and thus taking the whole Spring semester to prepare. I am also co-leading the trip with our Victorianist, so we’ve organized the course historically, and I’m primarily responsible for materials pre-1700. So far, we have covered Beowulf in connection with Sutton Hoo and the Staffordshire gold hoard, Sir Gawain and the Green Knight and the Arthurian myth, and the York Corpus Christi plays and the city of York. This past week, I wanted to cover two major figures in English history—Thomas Becket and Thomas More—as transitions between the medieval and early modern periods, before we usher in Shakespeare’s Titus Andronicus (which we will see in May at the Globe), alongside Stratford, the Globe, and early modern London next week. (For fun, I also assigned the rather historically-accurate “Shakespeare Code” episode of Doctor Who). As the truncated syllabus above demonstrates, my choices in assigned reading and discussion topics thus far have been conventional. Our readings and discussion for this past week, though, break from the norm. For one, I’m not actually taking our students to Canterbury this May. Given our limited time frame, we had to choose between Cambridge and Canterbury, and the Cantabrigians had it. Therefore, for this past week, I was less concerned about introducing my students to Canterbury Cathedral specifically and more concerned about how the narratives of Becket, and later More, could contribute to our trip overall. 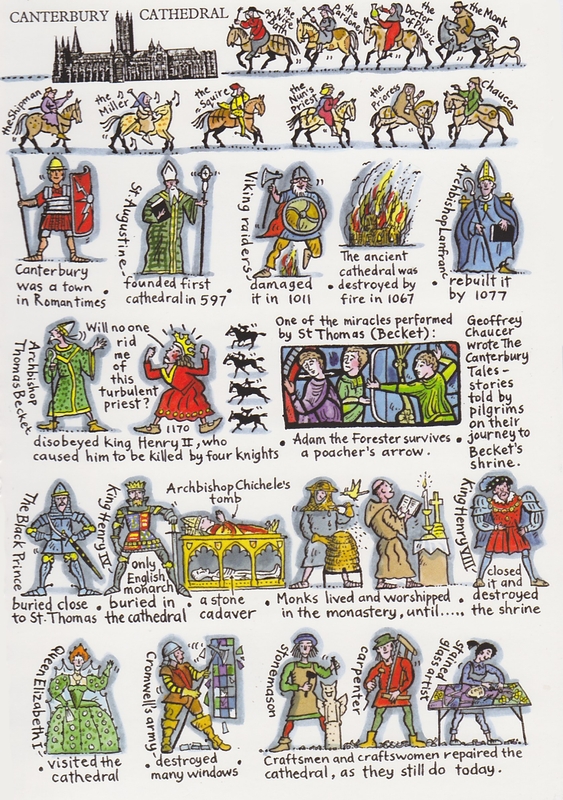 And two, instead of choosing primary texts, I picked popular, artistic depictions of Becket and More. Besides Simon Schama’s A History of Britain series that students watch each week, I assigned them to read T. S. Eliot’s Murder in the Cathedral (because one cannot get enough Eliot!) and watch Fred Zinnemann’s A Man for all Seasons (because one cannot get enough Orson Welles!). These two texts served as backdrops for my lecture “Two Undoubting Thomases” and the discussion that followed. Although we had already surveyed the city of York, and inevitably its minster, we had not spent much time reviewing the ecclesiastical structures and architecture of medieval and early modern England. I felt that Becket and More would make excellent case studies for these issues. So, I began Wednesday’s class by playing the Te Deum (which is referenced in Murder in the Cathedral) in order to expose students to some medieval liturgy as well as offer a taste of the kind of liturgical experiences we will encounter during our trip, such as attending evensong at St. Paul’s. I also used this opportunity to discuss the design of English cathedrals—transepts, quire screens, nave, chapels, etc.—to prepare them for the numerous cathedrals, other than Canterbury’s, that we’d visit on our trip. I also highlighted, for purposes of practicality, that cathedrals can be their compasses, (almost) always quivering east. Surprisingly enough, Mother Nature actually let us have class this week. Due to last week’s snowstorm, Chaucer, unfortunately, has been cheated, which causes me much pain. Nonetheless, we have forged ahead as best we can, particularly as we acknowledge with both excitement and a bit of nervousness that our travels are getting very close indeed. “Ay fleeth the tyme, it nyl no man abyde” (The Clerk’s Tale, l. 119). In particular, the British Library podcast, featuring Julian Harrison, Curator of Medieval Manuscripts, seemed to spark a lot of interest, especially among those students who have not had the opportunity to study the text itself (sadly, time does not permit us to take a look at it in this course). On Monday, as I indicated above, we played catch-up and were at least able to encounter The Canterbury Tales through The General Prologue. We worked on the exercise I described in my London post, which included locating points on a Google Map that correspond to each of the pilgrims. I found that there was a great deal of value in this project. First, we had to read the descriptions in The General Prologue very closely and carefully. Working in pairs, students took one pilgrim at a time and examined the information Chaucer embeds into his narrative. There was much relief when a pair drew someone like the Clerk – so clearly from Oxford! A second benefit of this exercise is that it forced us to look up those words and places that we tend to gloss over. Where exactly is Middelburgh and why would the Merchant be associated with it? Where is the Knight’s Tramissene? Where is the Stratford-at-the-Bow from which comes the Prioress’ French? Moreover, what is a Franklin? What does a Summoner do? On Wednesday, we turned to Thomas Becket, taking a look at his murder and his very real presence at Canterbury. I am fascinated by the monuments in his honor. The display (pictured below) is very powerful, particularly with its pairing to his name in red letters on the floor. 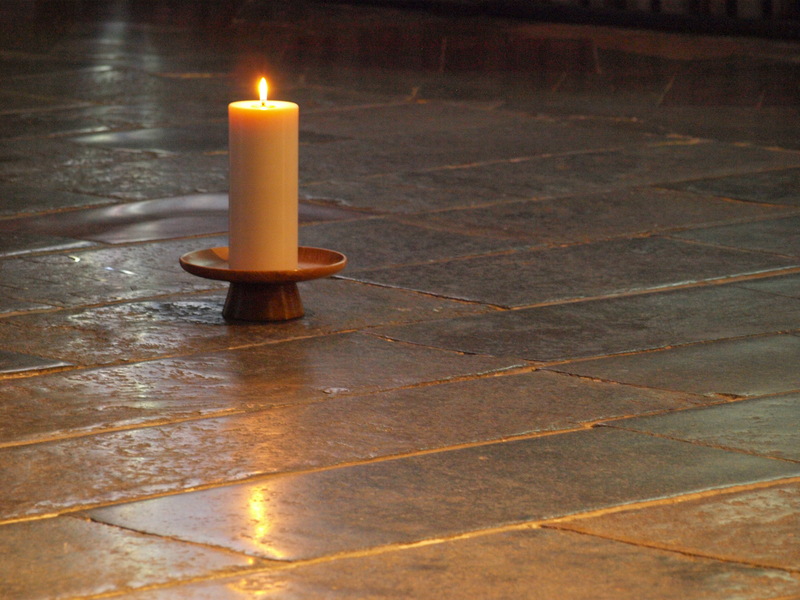 Even more, however, is the single candle which now resides in the place of his original shrine, destroyed in Henry VIII’s crime against humanity called the Dissolution of the Monasteries. The candle is a simple testament and yet captures perfectly the reverence held for the saint. Add in the utterly stunning stained glass stories of his martyrdom and miracles and it is quite an experience, one I am looking forward to sharing with my students. Speaking of stained glass, in class, we took a look at some of the windows; they are sometimes so difficult to see en masse in person. A useful resource, the Medieval Stained Glass Photographic Archive, while not complete, provides a map of Canterbury and locates photographs of the stained glass in their actual locations. One of the ideas I always return to when I consider Thomas Becket is how he is a political martyr. The Catholic Encyclopedia describes Becket’s change of habits after becoming Archbishop of Canterbury: “A great change took place in the saint’s way of life after his consecration as archbishop. Even as chancellor he had practised secret austerities, but now in view of the struggle he clearly saw before him he gave himself to fastings and disciplines, hair shirts, protracted vigils, and constant prayers. Before the end of the year 1162 he stripped himself of all signs of the lavish display which he had previously affected.” Before this moment, he is a constant companion to Henry II, often fighting beside him as well as enjoying the pomp of their positions. 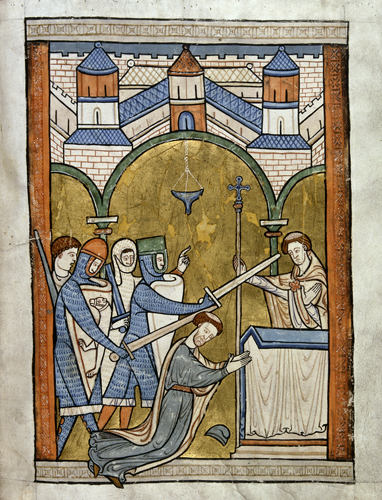 His disputes with the king, though related to church matters, are of a distinctly political nature, having more to do with Becket’s unwillingness to recognize Henry’s authority than any defense of the faith, Christ, or God. Naturally, Grim and other biographers write him in terms of his sanctity. Grim states, “Behold the simplicity of the dove, behold the wisdom of the serpent in this martyr who presented his body to the killers so that he might keep his head, in other words his soul and the church, safe; nor would he devise a trick or a snare against the slayers of the flesh so that he might preserve himself because it was better that he be free from this nature!” Yet he also describes the accusations the four knights use against Becket. They call, “Where is Thomas Becket, traitor of the king and kingdom?” Becket replies, “Here I am, not a traitor of the king but a priest; why do you seek me?” Later, right before attacking him, one of the knights cries, “I don’t owe faith or obedience to you that is in opposition to the fealty I owe my lord king.” In a letter archived in Roger of Hovedon’s chronicle and sent from William, Archbishop of Sens, to the Pope describing the murder, the Archbishop states, “they immediately, on the king’s behalf, denounced him [Becket] as a traitor.” Becket’s murder is indeed shaped as a matter of treason; he chooses his role as archbishop – or, as he is given dialogue by Grim, as a priest – over his duty to obey Henry. You throw in then the machinations among Henry, Becket, the Pope, and others in the years before that day in Canterbury, and the political nature of this murder become even more apparent. The differences between such a framework for martyrdom and the way other types of saints’ lives are constructed creates a great deal of potential, as do the differences between the historical reality (with embellishments and gaps in factual knowledge) of an archbishop’s death and the hagiographies which are more literary constructions. To take a brief look at this concept, we focused on analyzing the structure of Chaucer’s The Second Nun’s Tale as an example of hagiography. In class, we considered the elements of Cecilia’s life and what was necessary to create her story. Then, we turned to what we had read of Edward Grim and Roger Hovedon’s accounts of Becket’s life and death. There are a fair amount of similarities, as we might expect in the construction of a saint’s life. However, where they diverge often exists in this space between literary construction and historical figure. As I was doing my reading for this week, a fascinating personal connection developed. It has been years since I have done any reading about Becket and his murder, and, at the time, I remember finding one particular fact interesting. For some reason, however, it did not sink in. One of the knights who murdered Becket, indeed is given credit for striking the first blow, was William de Tracy. For those who haven’t made note of my surname, do so now and you will see why my interest was again piqued. For the record, I do not claim to be related in any way, but the name is enough to fire up my imagination and curiosity. This time around, I stopped to do a little digging. William de Tracy took his name from his mother, Grace, whose father is believed to be the illegitimate son of Henry I (Barlow 235-6). Now I ask myself – he is of Norman descent, yes? Thus, I turn to France. I am finding conflicting stories about the exact location from whence the family came, but one of these stories includes a little hamlet in Normandy near Bayeux called Tracy-sur-Mer. The fun part? My family and I stayed in Tracy-sur-Mer (chosen simply because of the name) last summer. Oh, how everything is connected and circles around. 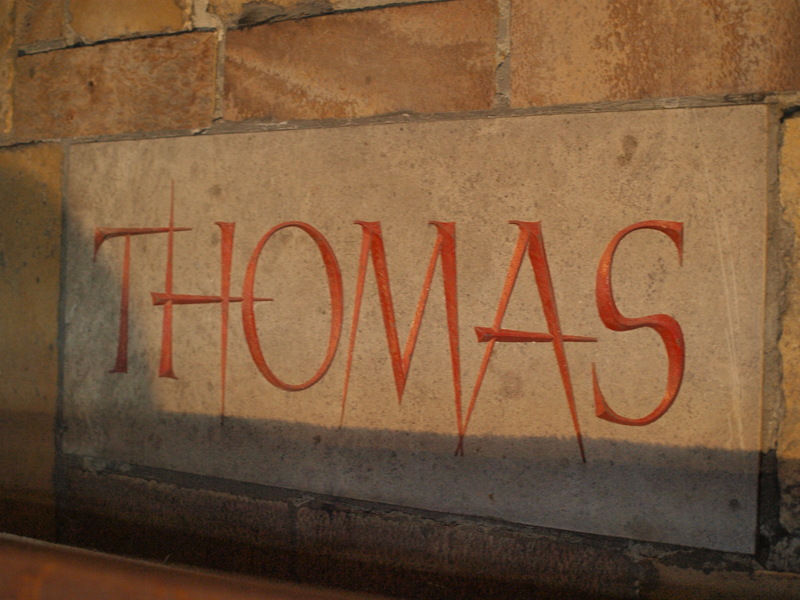 He had barely finished speaking when the impious knight, fearing that [Thomas] would be saved by the people and escape alive, suddenly set upon him and, shaving off the summit of his crown which the sacred chrism consecrated to God, he wounded the sacrificial lamb of God in the head; the lower arm of the writer was cut by the same blow. Grim’s descriptions go from gruesome to worse as he describes the vicious murder. The aftermath of Becket’s death is where the story gets more mysterious. Most accounts castigate the four knights, demonstrating God’s vengeance, or their hopes for such, on them. William, Archbishop of Sens, in the same letter as above, hopes that “their memories may be visited with everlasting maledictions.” There are some more charitable: “Tracy seems to have been the first to come to his senses: in a confession to Bartholomew, bishop of Exeter, apparently made in Devon shortly after the murder, he said that his heart sank and he feared that the earth might open up and swallow him” (Franklin). This image of remorse is a poignant one (not that I am trying to redeem my name!). One of my personal favorite legends is the report that, as de Tracy traveled to the Holy Land to serve as a Templar, part of his penance from the Pope for his deed, God would not allow him to reach his destination as winds prevented him from making the journey. Eventually, there were rumors he died of leprosy in Italy. Another asserted that he and his fellow conspirators were buried at the door of The Temple Church in Jerusalem. It seems more likely that he did indeed make it and return, establishing leper hospitals and chapels in attempts to redeem himself. All in all, quite the stories. Next week: we take a side trip to read about Robin Hood. Barlow, Frank. Thomas Becket. Berkeley: U of California P, 1986. Chaucer, Geoffrey. The Canterbury Tales. Librarius, 1997. Web. 10 Feb. 2014. Franklin, R.M. “Tracy, William de (d. in or before 1174), one of the murderers of Thomas Becket.” Oxford Dictionary of National Biography. Oxford UP, May 2006. Web. 11 Feb. 2014. Grim, Edward. “The Murder of Thomas Becket.” Trans. Dawn Marie Hays. Medieval Sourcebook. Fordham U, May 1997. Web. 12 Feb. 2014. Roger of Hovedon. “The Chronicle: On the Disputes between Thomas Becket, Archbishop of Canterbury and King Henry II of England.” Trans. Henry T. Riley. Medieval Sourcebook. Fordham U, Oct. 1998. Web. 12 Feb. 2014. Thurston, Herbert. “St. Thomas Becket.” The Catholic Encyclopedia. New Advent, 2009. Web. 12 Feb. 2014. London, thou art of townes A per se. As I discussed with my students this week, London creates some interesting difficulties, at least in terms of finding the physical remnants of the medieval city. That annoying Great Fire of 1666 has a lot to answer for! In some ways, however, the destruction is an opportunity for a little literary archaeology. As background, we read the chapter “Images of London in medieval English literature” in Ralph Hanna’s Cambridge Companion to the Literature of London. He begins his discussion with Dunbar’s poem as well. He notes that Dunbar is a “tourist . . . not only from outwith the City but outside the realm itself” (22). Dunbar’s poem demonstrates a respect, not for the royalty, but the merchant class. He lauds, “Upon thy lusty Brigge of pylers white/Been merchauntis full royall to behold” (ll. 33-4). As Hanna asserts, this focus “reveals that it had become possible, on the edge of the early modern period, to appreciate openly what in the Middle Ages may have been too problematic for discussion. A great many medieval literati, both authors and readers, will have found . . . mercantile culture a problematic concept, if not an outright oxymoron” (21). To illustrate this point, Hanna turns to older accounts and descriptions of the city. Then after this a decked-out troop from every guild. As well there was a fruiterer and poulterer. Hanna addresses these lines as a “dressed up” London, and perhaps we can also chalk it up to the fact that this particular work is “only” a hundred years prior to Dunbar’s. Nonetheless, it indicates that the mercantile activity of London was not as absent from the literature of the city as Hanna makes it seem. We did not take a look at Maidstone’s Concordia as a class; however, it is a rich text. In particular, it is a vivid description of traditional processional routes throughout the city. The two stops made by the king particularly relevant to our travels are St. Paul’s and Westminster Abbey. 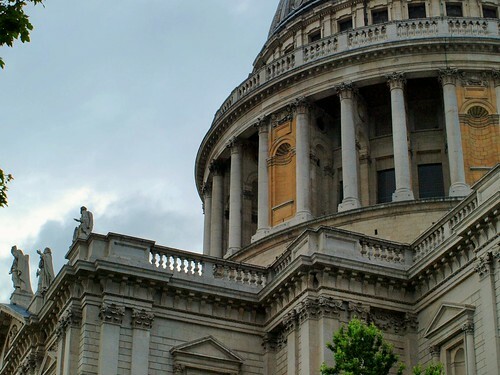 Hanna offers his thoughts concerning the significance of these locations: “[T]he king enters St Paul’s to make his offering to the City’s patron, St Erkenwáld, a famous Anglo-Saxon’bishop of London. But near the procession’s conclusion, the king effectively atones for any possible dereliction from or dilution of proper royal religious sympathies by a stop at Westminster Abbey” (25). The king’s stop at St. Paul’s is to honor the city and his stop at Westminster, traditional coronation site, honors the kingdom, demonstrating that the two are not always one and the same; indeed, they find themselves in conflict frequently. The reference to St. Erkenwald leads us to another very “London” poem. It has been a while since I have taken a look at the late 14th-century Saint Erkenwald, but, if I may be forgiven for quoting myself in an article I published a few years ago, “Defining the Medieval City through Death,” it is clear that the poem and the saint are distinctly London: “This work has long been acknowledged as a text intimately tied to the city [London] in which it is set. The poem’s opening prologue sets the text firmly within the English city, describing it as the ‘metropol’ and the ‘mayster-toun,’ ‘the chief city’ . . . [T]he pseudo-history of London is recounted throughout the course of the text – how Brutus founded the city and so forth – all of which is situated in chronological relationship with the life of Christ, the effect of which is to create a parallel timeline for the city . . . 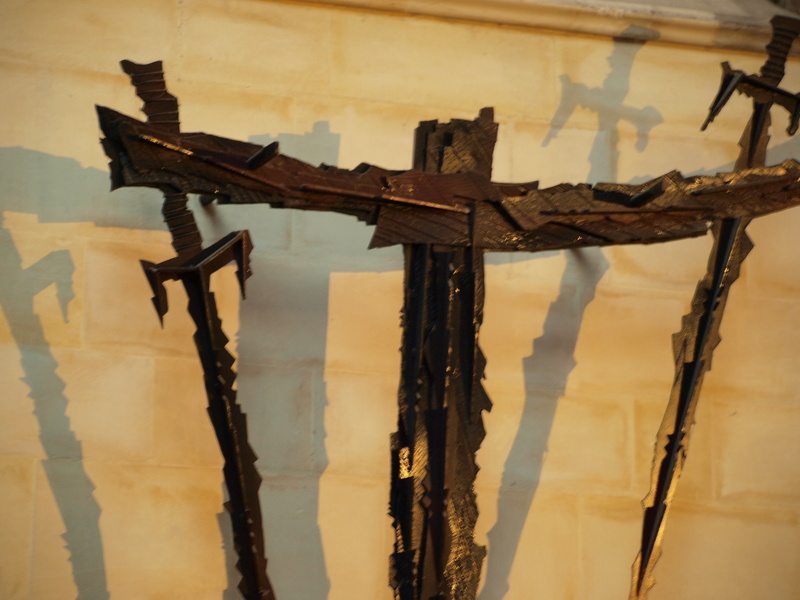 The Saint Erkenwald poem represents a nexus of these images – historical and contemporary London, St. Paul’s Cathedral, and a saint with strong urban ties” (200-2). St. Erkenwald is a local saint, London’s patron, his story resonating with the inhabitants of the city even as his body is physically present in St. Paul’s. In order to prepare for our visit – and perhaps lessen the element of shock in being there – we spent some time in groups in class researching the medieval histories of four of the “must see” sites we will get a chance to experience: St. Paul’s Cathedral, Westminster Abbey, Tower of London, and Temple Church. General discussion focused on the rebuilding or, at the least, the building on to of these landmarks as well as how William the Conqueror keeps showing up in these histories. 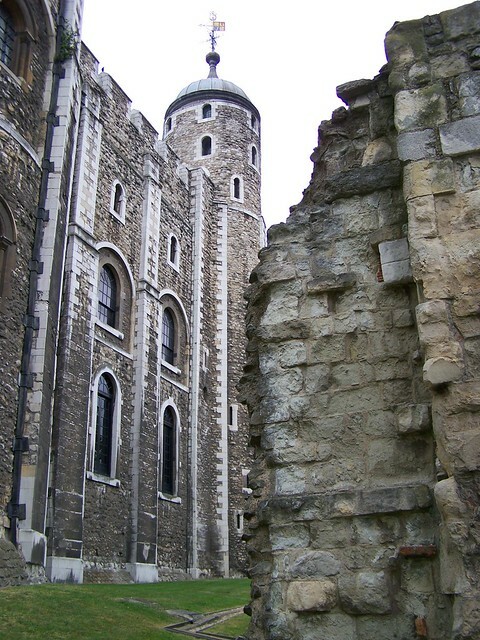 Beyond that, we took wild turns: learning about Templars, considering the separation between London and Westminster, wondering about the “oldest surviving door in England” in Westminster Abbey, thinking about how churches keep being rebuilt on the same locations, and reflecting on the crown jewels. 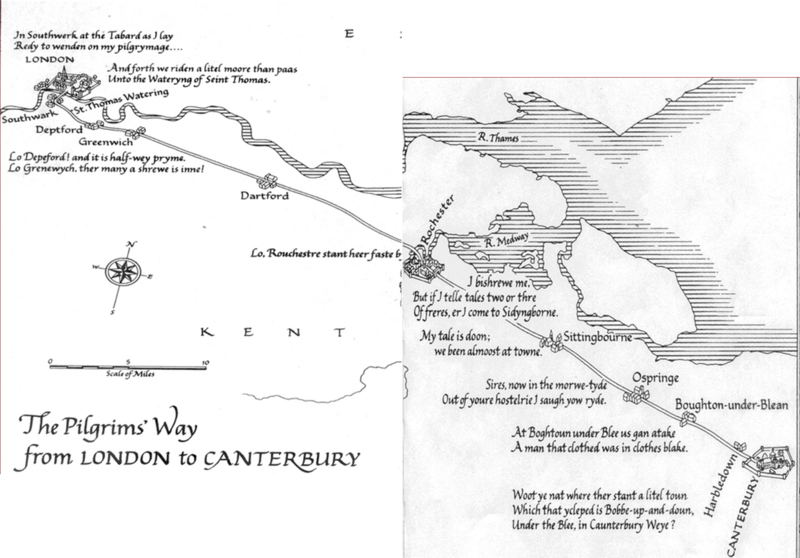 From London’s history and literary representation, we will be turning to London author Chaucer, starting our journey to Canterbury in Southwark with his pilgrims. I say “will be” because we have been delayed by Mother Nature’s strange preoccupation with snow. However, I’ll speak to our good intentions for playing catch-up. As I was rereading, I decided I wanted to think about our pilgrims in a different way than I have taught them previously. Given our focus on physical locations and locating literature within its geographical context, I thought it would be interesting to decide as a group upon locations that correspond to each of the pilgrims. To that end, I created a separate Google Map from our class project just for The Canterbury Tales, and, through discussion and some digging into the text, we will fix these locations. Some provide no difficulties – the Wife of Bath being the most obvious. However, others will require some close reading, research, and/or further extrapolation (based upon professions or other clues in the text). For those pilgrims whose tales we are also reading – these include the Cook, the Merchant, the Man of Law, the Pardoner, and the Second Nun – we can, if need be and is possible, use their prologues to help us. I have already posted locations based on their journey, including quotations from various prologues that allow us insight into where the travelers are. Snow willing, I will post again when we have completed this activity. I think it should be intriguing to see the results. As a side note: I am always amused by the Cook’s Tale. It’s just such a romp (and, for our purposes, a London romp), and, though it provides little in substance, it leaves us with Perkyn’s friend’s prostitute wife. It’s almost unfair that it stops there. The activity includes responding in journals about the information learned in these sites as well as reflecting on the experience of looking digitally at this manuscript. Part of the intention is to take a whirlwind tour of medieval manuscripts by looking at the Beowulf in particular. I am curious what the students will pull out for this exercise. Next week: we will continue our journey to Canterbury. Chaucer, Geoffrey. The Canterbury Tales. Librarius, 1997. Web. 3 Feb. 2014. Dunbar, William. The Poems of William Dunbar. Ed. Bellyse Baildon. Cambridge: Cambridge UP, 1907. Print. FitzStephen, William. “Description of London.” Florilegium Urbanum, 10 Dec. 2013. Web. 3 Feb. 2014. Hanna, Ralph. 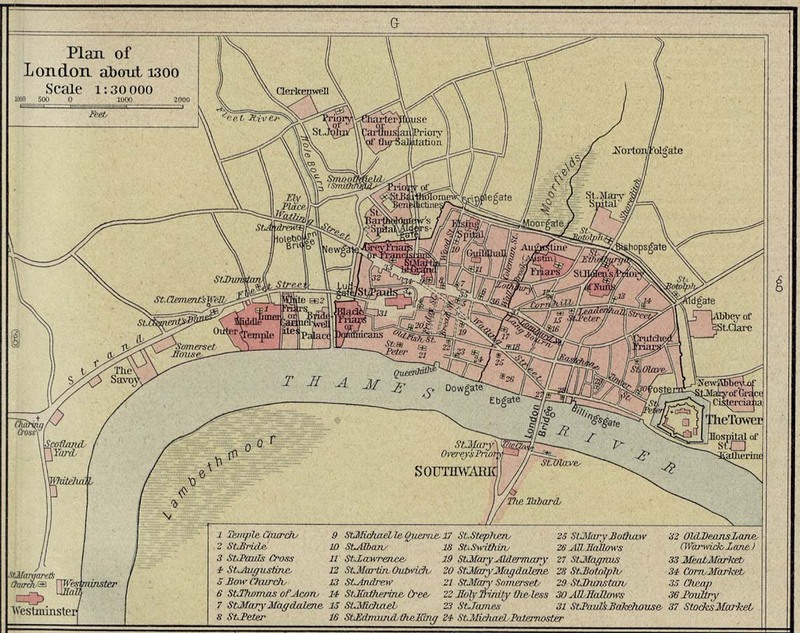 “Images of London in medieval English literature.” The Cambridge Companion to the Literature of London. Cambridge: Cambridge UP, 2011. 19-33. Print. Maidstone, Richard. Concordia (The Reconciliation of Richard II with London). Ed. David R. Carlson. Trans. A.G. Rigg. TEAMS Middle English Text Series. Kalamazoo, MI: Medieval Institute Publications, 2003. Web. 3 Feb. 2014. Tracy, Kisha G. “Defining the Medieval City through Death: A Case Study.” Urban Space in the Middle Ages and the Early Modern Age. Ed. Albrecht Classen. Fundamentals of Medieval and Early Modern Culture 4. New York/Berlin: de Gruyter, 2009. 183-204. Print. This week, in English Studies Abroad (see previous post), we are “visiting” Bath. By “visiting,” we are focusing our study and readings on the city, as we will do with different locations (or figures) each week. For Bath, my goal is to focus on the striations of history, important not only for this particular place, but also to set the tone for the rest of class as well as provide a basic overview of British history. It’s been intriguing preparing for this week because, not being an expert in the nitty-gritty details of each city, there are aspects I am learning along with my students. I love it as it increases my enthusiasm with the material. We started our “visit” with the city’s Roman-British history, which, of course, centers on the public baths, the hot springs being the reason people settled around it in the first place. Originally a shrine to the deity Sulis, the Romans named the area Aquae Sulis, co-opting the deity and aligning it with their Minerva. 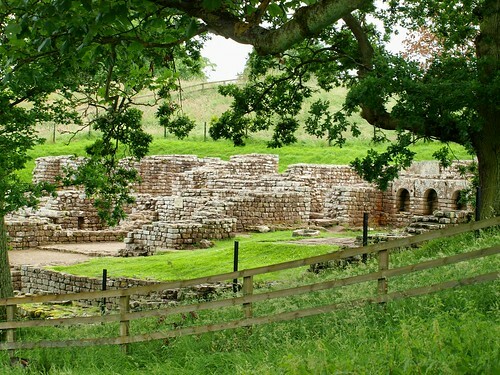 The Roman preoccupation with public baths is well-known, even to the point that they found it necessary to build them into the frontier forts along Hadrian’s Wall. I visited Chesters Fort a couple of years ago; the baths there take up about a third of the settlement (the following is a photo of the remains of the baths). I have been having a particularly entertaining time reading about the curse tablets people would throw into the waters, hoping to get revenge on those who have wronged them. The tablets, some on display at the Roman Baths, which we will visit, are quite explicit – asking for the blood of the cursed or something a bit more or less gruesome (interesting images and background on the tablets). When the Romans pulled out of England, we can imagine what places like Bath must have looked like, particularly a few centuries later, with the remains and ruins of their baths and stone walls. 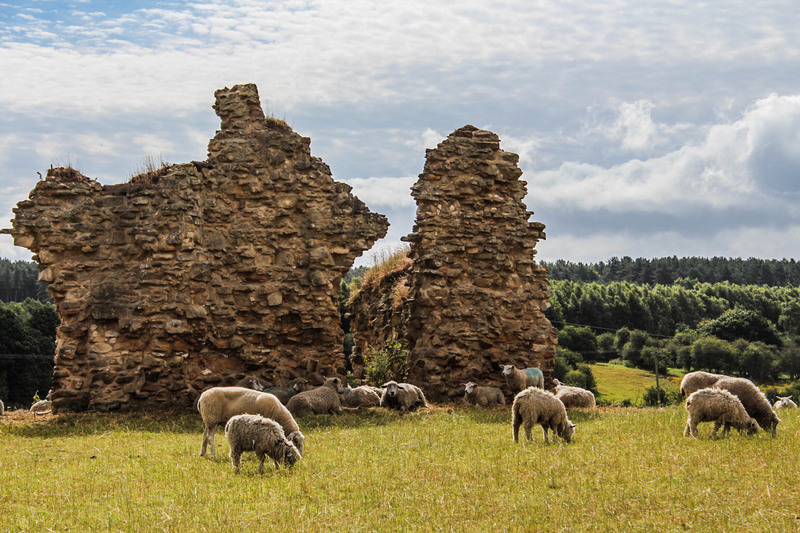 I ruminated in class about the idea that the images we see in the Exeter elegy The Ruin, if we step back from metaphorical readings, might be a glimpse of the experience of the Anglo-Saxon living with the physical Roman past. and shattered this city; the work of giants crumbles. I like to think about the connection to our own journey as we explore the ruins of generations that came after this poem’s composition. Of course, it is widely speculated, and often debunked that The Ruin is written about Bath, but it is still an idea I find poetic. The hot springs appear to have been widely known, if their appearance in the histories is any indication. Nennius, for instance, included them as one of his “Wonders of Britain,” a list often attached to the end of manuscripts of his Historia Brittonum. The pools at Bath were described as having magical properties – cooling and warming upon the desire of the bather. The reputation no doubt was increased by the perceived medicinal or miraculous, depending on your point of view, healing qualities. By the time we reach Geoffrey of Monmouth, Bath is associated with the great Battle of Badon Hill, thereby incorporating it into the Arthurian tradition to which Geoffrey’s work greatly contributes. In his Prophecies of Merlin, it is foreseen that Bath/Badon’s waters “shall grow cold, and their salubrious waters engender death” (VII.3). A portion of our discussion has focused on Bath’s position throughout its Roman and Anglo-Saxon history as a border or frontier town. 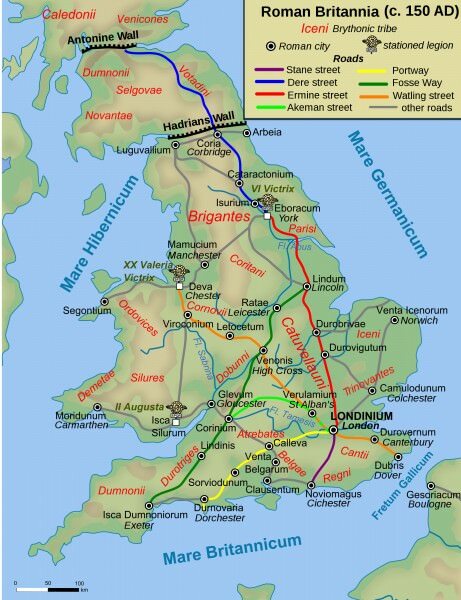 As we can see from this map of Roman Britannia (c. 150AD), Bath, not located on the map but which lies to the south and a bit to the west of Gloucester, is situated on the outer western borders of Roman-occupied territory. By the time of King Alfred the Great, Bath was a contested area between Mercia and Wessex (and even more so as the Danes pressed in from the north, before and after the Danelaw was created). 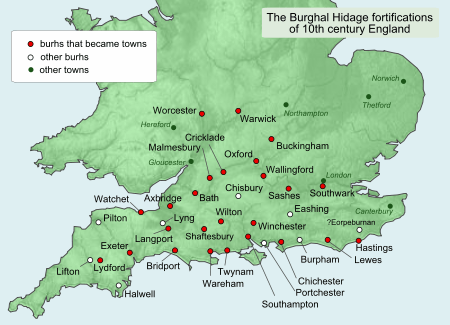 When Alfred began building up his series of fortifications throughout the kingdom, Bath was one of these burhs, listed in the Burghal Hidage, a document containing an account of these fortifications and their taxes (always an important piece of information for kings). At Bath, he had masons use the existing Roman stone as part of their reconstruction and strengthening of the city walls. The borderland space that Bath occupied created unique opportunities, including its development as an influential market town. That particular characteristic carried over for quite some time, particularly as it became known for its wool trade. The merchant guild was formally recognized in the 12th century. Eventually, Catherine of Alexandria became the patron saint of the city – her wheel of torture perceived in the requisite spinning wheels. How well known Bath became for its wool and textiles can be seen in Chaucer’s “General Prologue” to The Canterbury Tales. We find the Wife of Bath naturally associated with her clothing and her cloth-making skills: “Of clooth-makyng she hadde swich an haunt/She passed hem of Ypres and of Gaunt” (ll. 449-50). Readers would have more than likely been very aware of Bath’s foremost industry. We found it of particular note that Bath, after the Norman Conquest, was purchased by John of Tours following the Rebellion of 1088 between William the Conqueror’s sons. The winner William Rufus – quite a guy. He liked to sell or grant lands and bishoprics to his personal favorites. The note-worthy part of this exchange is the fact that John of Tours was a doctor (he was at the Conqueror’s deathbed). Given the persistent belief about the healing qualities of the springs, we can perhaps speculate that his occupation led to the rise in the next century of several hospitals, St. John’s, for instance. In the 13th century, leper houses developed, segregated baths built to ease their suffering. The hospitals, as was the wont of their medieval incarnations, served as hospices for the elderly, who were often soothed by the hot baths. There is so much more to think about, particularly the history of another of our destinations, Bath Abbey, which has fascinating historical striations on its own and is connected on every level to the city’s various pasts, from the Anglo-Saxon when it was first built to the later hospitals to its present incarnation. We can stop at medieval Bath or continue on with Queen Elizabeth I’s favor and the revival of its spas, which are extremely popular by the time we get to Jane Austen and Bath’s appearance in several of her works, including Persuasion (my favorite of the novels) and Northanger Abbey. An exercise I found enlightening as we prepare to visit Bath is a site put together for those interested in walking tours of southern England. 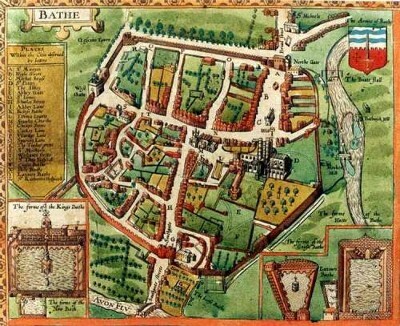 In its description of the walk, it overlays the outlines of medieval Bath with the present-day city. Comparing these descriptions to Google Maps (in satellite mode) is a useful way to visualize landmarks and timelines. Our Google Map project is getting off the ground, which you can see here (unfortunately, WordPress has not caught up with the new GM embed code). Also, here is the link to a collection of some of our online readings in Readlists (including background, news articles, texts, maps, etc.). Chaucer, Geoffrey. “From The Canterbury Tales: General Prologue, lines 447-478: The Wife of Bath.” Librarius, 1997. Web. 18 Jan. 2014. Davis, Graham, and Penny Bonsall. A History of Bath: Image and Reality. Lancaster, UK: Carnegie, 2012. Print. Geoffrey of Monmouth. “Arthurian Passages from The History of the Kings of Britain.” The Camelot Project. University of Rochester, n.d. Web. 18 Jan. 2014. Manco, Jean. Bath Past. Building History, 15 Oct. 2007. Web. 18 Jan. 2014. “Two Old English Elegies from the Exeter Book: The Wanderer and The Ruin.” Trans. R.M. Liuzza. English 401: Introduction to Medieval Literature. University of Tennessee-Knoxville, n.d. Web. 18 Jan. 2014. Weissman, Hope Phyllis. “Why Chaucer’s Wife Is from Bath.” Chaucer Review 15.1 (1980): 11.36. JSTOR. Web. 18 Jan. 2014.